Barbara Fischkin lives on Long Island with her husband Jim Mulvaney, a private investigator and Pulitzer-prize winning former investigative editor and reporter and their two sons Dan -- and Jack: the mythic long-suffering sibling who is also a star hockey player. Tactical Intelligence Services Inc., is comprised of professionals from law and law enforcement, intelligence, diplomacy, military, consulting, journalism and regulatory services from around the world. 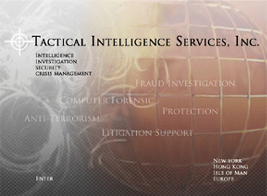 Tactical Intelligence professionals have served clients ranging from Fortune 100 companies to attorney law firms.